Project scope is part of the planning process of any project. Like any other aspect of a project, you want to determine how scope will impact the schedule of your project and, of course, it’s outcome. So, naturally, scope is important. But before you jump into that project plan and begin to tackle the scope of your project, let’s review the basics. It’s that part of the project planning process that determines and documents what are the project goals, deliverables, tasks, costs and deadlines. This way you begin to define the boundaries of your project and figure out what responsibilities you will task your team with, and the process by which that work will be verified and approved. This paperwork can be called your scope statement or terms of reference, but more often it’s referred to as a statement of work (SOW). You’ll be using this documentation throughout the project as a means to for you and your team to stay focused on task. When you’re documenting the project’s scope, have the stakeholders be as specific as possible to get a full and clear understanding of the project’s goals. That way you’ll avoid scope creep. Scope creep is what happens to a project when changes are made without any control. You end up putting in more work, time or effort because of poor planning or miscommunication, which can derail the project. If you want to stay within the scope of your project, then you’ll have a good communication plan in place. Communications are the most effective means to make sure everyone involved with the project knows what that project’s goals are and how they will be met. That’s why the scope of the project requires approval of the project stakeholders, to make sure it the project meets everyone’s needs. Now let’s move from the abstract to the practical. How do you define scope in your project? First, you have to make some assumptions. If you define scope after you have the facts, then the project is over and the whole point is moot. You’re going to want to define scope using several criteria. Deliverables What are the internal and external deliverables, the things the project delivers to the user and those the project generates itself, respectively. Functionality and Data This shouldn’t be a long process, just outline such details as if there are licensing agreements, payment process, customer management, etc. Technical Structure Here you’ll define where the project is focused on infrastructure in a table or diagram, and you can lso indicate the purpose of each of these components, however vague that might be at this point. There are other considerations to take when defining the scope of your project. For example, you’ll want to identify major business events, locations, functions and any processes affected by the project. Who are the people or groups of people both inside and outside the project who will be impacted? Any change that is going to influence the project needs to be uncovered. Projects will often fail because the scope wasn’t clearly defined from the outset or a mismanagement of changes to scope during the execution of the project. By defining scope you do a multitude of good for the project. Managing a project is really managing its scope. That means achieving the goals of the project within the time and budget approved by the stakeholders. But those decisions are not necessarily binding. Things change, of course, but you have to make sure those changes are aligned with the stakeholder’s project goals. Managing project scope means from the start that you and the stakeholders have a clear line of communication. You have to know their vision to know what they’re expecting in a project. That way, when change happens you can direct it to meet the project’s goals while keeping the overall project on track. But that’s just the beginning. We outlined this above, but to reiterate: know the parameters of the project. But there’s more. Once you’ve gotten that information from the stakeholders, now you have to communicate it to your team. This helps them with buy-in as well as giving them the autonomy, avoiding micromanaging later on in the project. That goes for your business users, as well. They, too, must be made aware of the scope in project management, as does everyone involved in the project. They must know what is expected of them and why. Keep the lines of communication open as things change. Once your team has been briefed on what scope in project management is, you need to train them to react correctly when change occurs in the project. They’re on the front lines of the project, and you don’t want to have to be pulled away every time a change happens. If the team has been taught to identify change and act on it and know when you have to be brought it, then the project is more efficient and productive. Communications is the part that speaks to the whole when managing scope in a project. If you can communicate what it is you want, you’re not going to get it. Therefore communications is a constant throughout the life cycle of the project, whether it’s with your team, stakeholders or business users. What makes communications effective is not just talking clearly and getting your point across concisely, it’s listening. By hearing what people are saying, and giving them a chance to say it, you get your message across better and the people you’re communicating with know you respect their opinions and will work harder to keep the scope of a project on track. A great tool to keep scope creep at bay is a baseline. You can use a baseline as a metric to chart your planned versus actual schedule dates. How to baseline projects is how to keep a project on track by monitoring what you planned against what is actually happening in the project. If you follow these steps, then you’re on the road to project success. 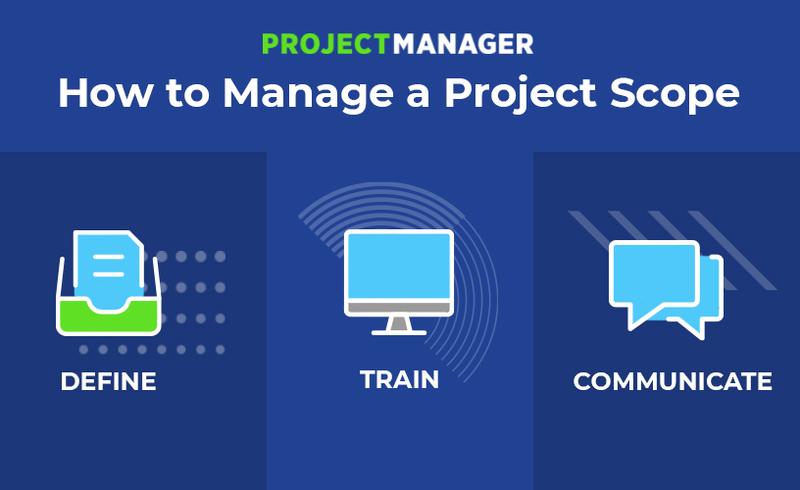 The best way to manage scope in a project is to have an online project management tool that gives you real-time data so you can act when issues arise and before they become problems. ProjectManager.com is cloud-based, so when your team updates their statues, from wherever they are and at whatever time, that information is immediately updated and you can monitor the progress of your project more accurately. See for yourself by taking this free 30-day trial. 10 Million Project Managers – Join the Movement!